Private park-like setting nestled on a cul-de-sac is a little slice of heaven! 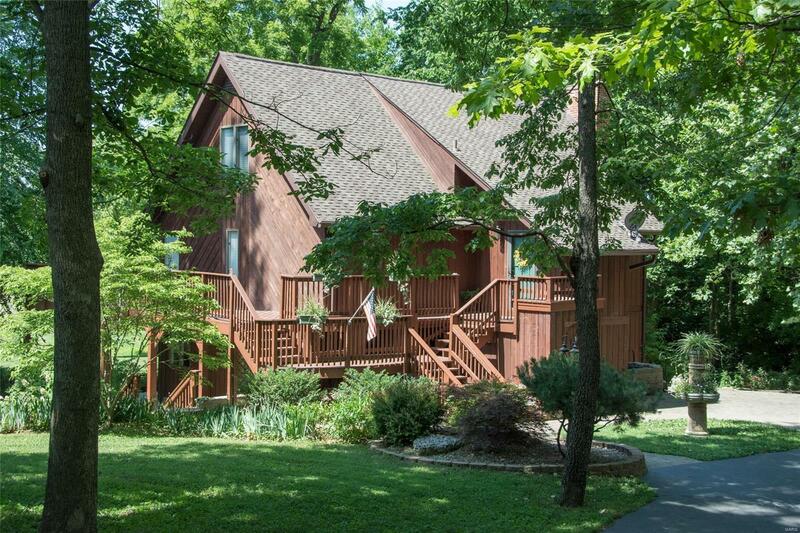 Quick access to SAFB, HWY 64 & 25 min to downtown STL. Enjoy panoramic views from the living room w/ oversized windows & a beautifully well-maintained deck & walk-out patio. Main level offers gleaming hickory hardwoods, gas fireplace, updated cabinets & large island with plenty of storage. Master suite on main level complete with newly remodeled bath including huge walk-in shower, closet and sliding doors to deck. Upstairs offers 2 large bedrooms w/ updated jack-n-jill bath. Walk-out lower level boasts large 2nd living area w/ stunning gas fireplace, tons of storage, office with built-ins, bedroom & full bath. Storage is no issue, garage has a huge bonus room. 50yr roof in 2012, new HVAC & Water Heater in 2009. Tons of character and updatesâseeing is believing!